Olduvai Gorge is a dry valley found within the Serengheti Plains of northern Tanzania, near the western margin of the Eastern Rift Valley. The area’s name is derivedfrom the word “Oldupai”, the Masai word for a type of agave plant that grows in the region. The valley bifurcates, forming a large, main gorge and a smaller side gorge. Together, these branches cover roughly 50 square kilometers (km2), exposing approximately 100 meters (m) of fossiliferous sediments. In 1911, a German entomologist, Wilhelm Kattwinkel, serendipitously stumbled upon the gorge while collecting butterflies1. Along with his intended specimens, Kattwinkel also collected a handful of fossils that included teeth belonging to an extinct genus of horse, Hipparion1. Back in Berlin, these fossils roused the interest of German geologist, Hans Reck, who led the first organized expedition to the gorge in 19131. During this inaugural expedition, Reck named the sedimentary formation overlaying an igneous platform of lava flow as the “Olduvai Beds.” He recognized 5 distinct units and numbered them accordingly, Beds I-V1. Though a number of animal fossils were recovered during Reck’s initial expedition, almost all of his specimens were destroyed during World War I, with the sole exception of a bovid horn core1. Reck also discovered a number of geological specimens that attracted the attention of Louis Leakey, who interpreted the remains as early stone tools. Leakey was unable to follow up on this interpretation, as research in the gorge ceased between 1914 and 1918 when Olduvai became part of German East Africa per World War I. Leakey resumed research in 1931 and led an expedition to the gorge, inspired by possible evidence of early human occupation. Leakey’s work in the gorge from 1931 to 1932 culminated in the publication of Reck’s stratigraphic numbering system in the first monograph on Olduvai Gorge in 19512. Unfortunately, his Olduvai visits were sporadic and brief between 1931 and 1960, due to a lack of funding and political instability1. It was during one of these visits in July of 1959 that Mary Leakey identified a partial cranium that appeared quite human but with remarkably large cheekbones and teeth3. In his 1959 publication, Louis Leakey described an early hominin with distinct non-human features. He designated the specimen (OH 5) as a member of a new species of hominin3, now recognized as Paranthropus boisei. Throughout the 1960s and early 1970s, Leakey and colleagues discovered many more hominin remains at Olduvai (OH4 – OH 56)4,5, including the first remains of Homo habilis (OH 7)6 as well as remains of Homo ergaster. The impressive lot of hominin discoveries made by the Leakey expedition team at Olduvai gained the attention of The Research Committee of the National Geographic Society, the Wenner Gren Foundation and the Wilkie Foundation, who contributed generous funds to Leakey’s research team7. With secured financial backing, long-term excavation and research at Olduvai Gorge was possible. Additionally, the productivity of Olduvai encouraged researchers to begin exploring other regions of East Africa for clues into human evolutionary history. In 1985, research continued at Olduvai by collaborating teams from the National Museums of Tanzania, the Tanzanian Department of Antiquities, the Institute of Human Origins, and the University of California, Berkeley8. There has been an outpour of discoveries and reports from the site ever since. Today, Olduvai’s hominin fossil record is virtually unsurpassed. At least 4 hominin species have been recovered from the Olduvai deposits, representing nearly 2 million years (Ma) of hominin evolution: Paranthropus boisei, Homo habilis, Homo ergaster, and even modern Homo sapiens9. Stone artifacts have been recovered from all Olduvai sedimentary layers, allowing anthropologists to document the advancement of tool technologies over time. In fact, the gorge’s name has been given to some of the earliest recognizable tools, known as Oldowan tools. Impressively, the gorge itself is not exhausted, and it continues to produce paleontologically and archaeologically even today. One of the first hominin discoveries at Olduvai, found by Hans Reck in 1911, turned out to be a modern human burial10. Since that time, however, discoveries spanning nearly 2 million years (Ma) and representing 3 separate early hominin species have been identified within Olduvai’s sedimentary record. The earliest of these hominins, Homo hablis, existed in East Africa as far back as ~2.5 million to 1.7 million years ago (Ma)9. The two other species found at Olduvai, Paranthropus boisei and Homo ergaster, existed from ~2.3 - 1.2 Ma and ~1.9 Ma - 780 Ka, respectively9. All material discovered at Olduvai is identified using the naming convention that includes some combination of the area of the name, (e.g. OH stands for Olduvai Hominin), the name of the discoverer (e.g. Freda Leakey), and the word “korongo” which meaning “gully” in Swahili9. In 1959, Mary Leakey came across one of the most significant finds at Olduvai Gorge, a nearly complete subadult cranium eroding out of the uppermost part of Bed I (Level 22) at the Frida Leakey Kongo (FLK) locality3. The cranium, designated OH 5, belongs to the early hominin species Paranthropus boisei, sometimes referred to as the robust australopithecines. The OH 5 cranium dates between 1.85 – 1.79 Ma, and displays a unique array of traits that had not been identified in any other hominin fossil at the time of the specimen’s discovery. Louis Leakey believed that the uniquely robust anatomy of the OH 5 cranium warranted a new species designation3. As a result, he proposed the name Zinjanthropus boisei, where “Zinj” derives from the Arab word Zanj in general reference to East Africa, and “boisei” paid tribute to one of the team’s benefactors, Mr. Charles Boise3. Less than a year later, however, analyses11 demonstrated that “Zinj” cranial morphology fell well within the known range of variation of the accepted genus Paranthropus. Though OH 5 is still referred to as “Zinj” from time to time, the genus Zinjanthropus has been subsumed under Paranthropus, and OH 5 now stands out as the holotype for P. boisei. The mandible of OH 5 has never been recovered, although P. boisei mandibles have been identified from other localities, such as the nearly complete mandible Peninj 1 discovered roughly 50 miles north of Olduvai near the western shore of Tanzania’s Lake Natron12-14. Additional dental specimens attributed to P. boisei found at Olduvai include isolated incisors and molars (OH 30, OH 38, and OH 46)13,15. Taken together, these specimens reveal morphologies that suggest P. boisei had uniquely robust masticatory anatomy. For example, the species exhibits severe postorbital constriction (i.e., a narrowing of the skull directly behind the orbits) reflecting a small brain size and accommodating enlarged chewing musculature. A sagittal crest located along the top of the cranium provides a large platform for muscle attachments. The cheek bones (i.e. zygoma) arise far forward on the face and flare laterally, unlike any previously known specimens. In addition, the post canine dentition is extremely large relatively to the incisors and canines3. Functionally, these craniodental features may have allowed for massive and/or repetitive biting force9. If these features were adaptations related to mastication, then it suggests that the Paranthropus diet often consisted of hard (e.g. nuts) or tough foods (e.g. tubers or sedges). 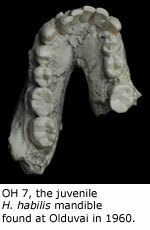 Despite the derived masticatory adaptations, P. boisei postcranial anatomy resembles some members of Australopithecus9. The similarities between the Paranthropus and Australopithecus postcrania have led some researchers to describe Paranthropus as the “gracile” australopithecines. Part of this contention stems from a relative lack of definitive association between known P. boisei cranial and postcranial material. A tibia and fibula (OH 35), and a nearly complete ulna (OH 36) found at Olduvai are possible P. boisei postcranial material. However, the assignment of these specimens to Homo habilis remains a strongly supported possibility16-18. A partial left femur, known as OH 20 (~1.79 – 1.66 Ma) was discovered in 1959 on the excavation surface at locality HWK13. Researchers did not immediately identify it as a hominin femur13, although later comparisons with known Australopithecus proximal femora19 confirmed its hominin affinities. While OH 20 lacks a head and greater trochanter, it appears to share some features with femora attributed to Paranthropus robustus, including a long, broad, anteroposteriorly compressed neck, a vertically expanded greater trochanter, a posteriorly located lesser trochanter, deep trochanteric fossa, and a groove for the obturator externus on the posterior neck13. These features support the assignment of OH 20 to P. boisei, rather than the contemporaneous H. habilis20. OH 20 constitutes the only postcranial specimen found at Olduvai explicitly assigned to P. boisei. Although the lack of postcranial material leaves the postcranial hypodigm of P. boisei uncertain, the cranial specimens exhibit an inferiorly placed foramen magnum, strongly suggesting that the habitual posture of P. boisei was similar to modern humans. Thus, P. boisei was probably a small-bodied biped, similar in size to Australopithecus africanus, which stands in in stark contrast to their robust masticatory apparatus9. Olduvai provides some of the best records of Homo habilis, one of the earliest members of the genus Homo that existed from 2.45 to between 1.8 and 1.4 Ma9. In 1960, several hominin fossils were recovered in Middle Bed I deposits at locality FLK NN in Bed I (Level III)7, just 2 feet below and 300 yards away from the “Zinjanthropus” cranium locality7,12,16. Among these fossils was a mandible dubbed “Jonny’s child” because the juvenile fossil was discovered by Louis Leakey’s son, Jonathan14. The site also yielded two clavicles, phalanges (i.e., finger bones), a partial foot, and ribs. The juvenile mandible, skull fragments, and phalanges were designated OH 7. Some of the 13 fragmented pieces of OH 7’s hand material (phalanges and tarsals) exhibit a mosaic of primitive and derived features. In particular, the phalanges (e.g. proximal, middle, and distal) are robust and curved, similar to the extant chimpanzee condition9 that is adapted for underbranch suspension and locomotion. The distal phalanx, however, exhibits a well-developed apical tuft, a human-like feature associated with a precision grip (i.e., the ability to grasp an object between the tip of the thumb and the tip of any other finger)9. Along with this precision grip, Leakey also inferred that the lithic assemblages associated with the hominin material as evidence that H. habilis manufactured and used stone tools. Leakey concluded that OH 7 was a primitive ancestor of Homo, and designated OH 7 the holotype of a new species he called H. habilis, which quite literally means “Handy Man”6. When compared to Paranthropus boisei, the OH 7 jaw exhibits relatively larger incisors and canines with reduced cheek teeth that were more round than oval in outline. Cranially, OH 7’s fragmented skull material implies a brain size of roughly 680 cc, which is considerably larger than the australopithecine average of 500 cc22. The cranial material recovered from Olduvai suggests H. habilis had a larger brain and smaller cheek teeth than Australopithecus or Paranthropus9. However, other hominin localities in east Africa have yielded H. habilis crania exhibiting relative brain sizes that fall well within range of Australopithecus (e.g., KNM-ER 181323. As such, some authorities distinguish the smaller-brained, smaller-toothed H. habilis specimens from the larger-brained, larger-toothed specimens, assigning the latter material to Homo rudolfensis. With this in mind, it is noteworthy that OH 65 is a partial maxilla that may be reminiscent of the KNM-ER 1470 maxilla, a specimen attributed to H. rudolfensis9. Thus, if one accepts that the 2 size variants represent different species, it is possible that H. rudolfensis was also present at Olduvai 9. As an articulated set of fossilized foot bones, OH 8 (~1.9 – 1.8 Ma) is one of the oldest and best preserved examples of early hominin foot morphology that has allowed anthropologists to better understand bipedal evolution. The foot is mostly complete, with all tarsal bones and metatarsal (heads and shaft) present. Similar to modern humans, and unlike great apes, the big toe (hallux) is relatively adducted and robust24. An adducted, robust hallux is indicative of the modern bipedal gait, in which the big toe bears a substantial load during propulsive toe off. Thus, OH 8 belonged to a bipedal hominin. The allocation of OH 8 to H. habilis is based partly on this inference, and in part because it was found alongside the OH 7 mandible and hand, which are unequivocally subadult and belong to the H. habilis type specimen9,17,18. The allocation of the OH 8 foot to H. habilis has not gone undisputed. Some researchers believe that OH 8 belongs to P. boisei because of its morphological similarity to a P. robustsus talus known as TM-1517 from Kromdraai25,26. A recent reexamination of OH 8 concluded that the specimen was not a subadult27, a conclusion that does not explicitly influence its assignment as either H. habilis or P. boisei, but rather weakens the likelihood that OH 8 is from the same individual as the OH 7 H. habilis specimens. Additional information about the H. habilis body plan derives from OH 62, a partial skeleton of H. habilis found at Olduvai in 1986. The OH 62 skeleton consists of more than 300 skeletal fragments, including parts of the skull, a partial humerus, radius, ulna, partial proximal femur, and partial proximal tibia. The best preserved part of the skull is the palate. Tooth row shape and tooth size supports the designation of this material as H. habilis, and not Paranthropus. Since OH 62 contains elements of both the forelimb and hindlimb, researcher can reconstruct various aspects of body size and shape, including limb proportions. However, because of the incompleteness of the OH 62 specimen, some researchers have compared it to another H. habilis skeleton from KNM-ER 3735 from Koobi Fora to form a more complete picture28. When considered together, the hindlimbs appear relatively elongate compared to the forelimbs. Although these two specimens are disparate in body size, with KNM-ER 3735 representing a much larger-bodied individual, the evolution of modern human limb proportions appears to have involved a lengthening of the hindlimbs before a shortening of the forelimbs9. In sum, the H. habilis material from Olduvai Gorge demonstrates that this taxon differs broadly from australopithicines in its cranial anatomy by having a larger brain size and smaller cheek teeth. The limb proportions of H. habilis may have differed from those of the Australopithecus, by a lengthening of the hindlimb. Additionally, the OH 8 foot implies the ability for striding bipedalism. In contrast, the H. habilis forearms remained long, and its hands generally indicate that arboreal climbing remained an important part of its locomotor repertoire. H. habilis appears to have undergone an increase in brain size before an increase in body size or achieving fully modern human-like limb proportions. The first definitive cranial remains for Homo ergaster were discovered at Olduvai in 196029. H. ergaster is a predominantly African hominin species that existed between ~1.9 – 780 Ka9. OH 9 (~1.47 Ma) and OH 12 (~1.25 Ma – 780 Ka) are both fragmentary crania from Upper Bed II at site LLK, and the surface of Bed III at VEK, respectively9,30. OH 9 was found around the same time as OH 7 and OH 8 (Homo habilis), but higher in the sedimentary sequence. OH 9 preserves much of the skull cap, which exhibits typical H. ergaster morphology in that it is long and low, bears prominent brow ridges, and an estimated cranial capacity of 1067cc14. OH 12 consists of fragmented elements including the posterior cranial vault, temporals, maxillae, frontal with interorbital region, and the coronoid of the mandible31. OH 12 is younger than OH 9 by as much as 700 Ka31, and is absolutely smaller than OH 9 in brain size and palate size. In fact, OH 12 is both the geologically youngest and smallest known adult H. ergaster. Nonetheless, OH 12 exhibits features such as an occipital torus and swelling at the bregma, and other similarities to H. ergaster specimens (KNM-ER 3733) that support its placement in the species31. OH 28 represents the only known postcranial material known for H. ergaster from Olduvai. OH 28 consists of a partial hip bone (innominate) and a thigh bone (femoral shaft) discovered in situ at locality WK (Wayland’s Korongo) by Mary Leakey in 1970. The OH 28 find is significant because it allows researchers to make inferences about the statue and locomotion of H. ergaster using the specimen’s preserved hindlimb bones. For example, the H. ergaster hip is anatomically similar to that of modern humans, and clearly indicates that H. ergaster was a habitual biped32. In other words, unlike the earlier australopithicines and possibly H. habilis, who might have employed both arboreal climbing and bipedal locomotor behaviors, H. ergaster relied solely on terrestrial bipedalism. Additional postcranial differences between Australopithecus and H. ergaster include an increased body size, lengthening of femur, and a shortening of the forelimbs. Overall, analysis of OH 28 further supports the idea that the general body plan of H. ergaster resembles that of modern humans. The probability that Paranthropus boisei manufactured stone tools at Olduvai remains unresolved. It is important to note, however, that the number of P. boisei specimens exceed those of Homo habilis at Olduvai, and that some lithics derive from the same stratigraphic horizon as both P. boisei and H. habilis (e.g., “Zinj” floor, at FLK)9. Louis Leakey is credited with discovering the earliest known stone tool making industry during his research at Olduvai in the 1930s. Named after Olduvai, evidence for the Oldowan industry has been found throughout Africa dating as far back as ~2.6 Ma up to ~250 Ka9,33. At Olduvai, the oldest known deposits associated with Oldowan tools date to 2 Ma, including Bed I9. Oldowan tools are typified by crude, deep flaking. Early interpretations believed the core (i.e., the portion of the rock from which flakes are detached) was the primary tool, and that the flakes were lithic waste33. Further analysis demonstrated the flakes were the intended tool, and were utilized for cutting and scrapping woods, plants, and meat34. The shapes of these flakes are determined primarily by the original form of the available raw material. Flake production was unstandardized, with little forethought put in to the style or design of the tool. The “chopper” is the classic example of Oldowan technology. However, the Oldowan toolkit also includes scrapers, discoids, spheroids, awls, burins, as well as hammerstones and anvils9. The raw materials used to make the tools are indigenous lava and chert cobbles, either found in lake deposits or washed in by rivers. Because many of the tools are made from these river cobbles, Oldowan was once referred to as a “pebble” industry. The production of Oldowan tools is almost always first attributed to Homo habilis9,34. However, these tools have been recovered in association with Paranthropus boisei as well9, spurring debate about whether both of these hominins were capable of manufacturing these tools. By 1.5 Ma, large cutting tools appeared at Olduvai, signaling the advent of the Achuelean industry. Similar to the Oldowan industry, the Acheulean tools at Olduvai, derived from the upper strata of Beds II and Beds IV9. The large cutting tools that characterize the Achuelean industry were produced by uni- or bi-directionally trimming the lateral edges of large flakes or slabs34. Unlike Oldowan tools, Achuelan tool production was relatively standardized, and reflects forethoughts and spatial preconceptions in the tool manufacturing and stylization process. The classic example of Acheulean technology is the “handaxe”, a teardrop-shaped biface9. However, the Acheulean toolkit includes hand-held devices used for heavy butchery tasks, such as the cleavers, picks, and knives. The production of Achuelean tools is attributed primarily to Homo ergaster9. 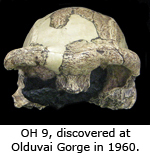 Olduvai is one of the most faunal rich assemblages of all the hominin fossil localities. Reptiles, birds, antelopes, zebras, elephants, pigs, hippos, giraffes, bovids, and primates, as well as numerous small mammals, including rodents, rabbits, and porcupines, are all represented. Generally, the Olduvai Gorge faunal evidence supports an overall change in climate from humid to arid conditions. Lower Bed I (~2 Ma – 1.75 Ma) is replete with urocyclid slugs, which indicate a relatively moist habitat35. Additionally, birds known to inhabit wet, swampy marshy areas, including cormorants, pelicans, ducks, gulls, flamingos, herons and storks are abundant in lower Bed I; however, by upper Bed I, land birds are most common35,36. Murid rodent species that occupy wet habitats are common in lower Bed I, but are absent by upper Bed I, and replaced by species that signal a drier habitat36. Finally, the presence of reduncines which graze near water sources dominate most of the bovid assemblages that derive from lower Bed I36, while an increase in bovids associated with more open and arid environments are found in the uppermost part of Bed I37. Few primates are found throughout Bed I, constituting just 5% of the macromammals. However, hominin material dominates several of the paleontological sites, including FLK-NN336. Hominin fossils have been recovered from every geologic bed identified at Olduvai, including Paranthropus boisei, from Beds I and II (upper and lower), Homo habilis, from Beds I and lower Bed I, Homo ergaster, from upper Bed II, and Beds III and IV, and Homo sapiens, from the Masek and Lower Ndutu Beds9. Olduvai Gorge is a steep-sided basin formed as a result of tectonic plate extension and the growth of the Ngorogoro Volcanic Highland to the east and south35. The gorge is made up of 2 usually arid river branches: the larger, northern Main Gorge and the smaller, southern, Side Gorge. Summed, they expose over 50 km of fossiliferous deposits, revealing a 2 million year long record of flora and fauna9. Significant fossil sites often occur where gullies cut into the basin walls. “Gully” translates as “korongo’ in Swahili, and as such, fossil sites are typically a combination of the name of their discoverer(s) and Korongo. For example, the FLK site stands for “Frida Leakey Korongo”9. In 1913, a german geologist named Hans Reck first identified and devised the numbering system for the stratigraphic units at Olduvai1. Reck named the sedimentary rocks that overly an igneous platform of lava flows the “Olduvai Beds”, and recognized 5 distinct units (Beds I-V). Unfortunately, Reck, a German citizen, was prevented from continuing his work at Olduvai when the United Kingdom acquired the territory under the 1919 Treaty of Versailles. However, Louis Leakey’s early work at Olduvai from 1931 to 1932 culminated in the publication of Reck’s numbering system in the first monograph on Olduvai Gorge in 1951. Much of this geological sequence is still in use today, with the exception of the uppermost part of Bed IV and Bed V, which have been revised as the Masek, Ndutu, and Naisiusiu9,15. Bed I is the oldest and thickest of the major subdivisions35. Deposition of the unit began ~2.03 million years ago (Ma), and at some sites, spans almost half the entirety of the Gorge’s vertical stratigraphy. Bed I contains 5lithofacies, including lava, lacustrine, lake margin, alluvial fan, and alluvial plain deposits35, the composition of which reflect that a borad shallow lake was present when the deposits formed9. Many of the paleontological and archaeological finds from Bed I derive from the Olduvai southeastern lakeshore, suggesting that freshwater streams carrying these deposits flowed into the lake. Notably, Bed I contains the “Zinjanthropus” floor. Paranthropus boisei and Homo habilis are known throughout the sequence, as are Oldowan tools, particularly at the upper part of Bed I. The oldest hominin specimen from Bed I is OH 24, a Homo habilis cranium, which is bracketed between Tuff IA (1.99Ma) and Tuff IB (1.87-8Ma). The freshwater lake present during Bed I’s deposition period persisted until the lower part of Bed II, which formed around ~1.75 Ma and 1.20 Ma9. The lower part of Bed II is thus largely similar to Bed I in composition, with lacustrine, lake margin, alluvial fan, and eolian lithofacies35. Lower Bed II also contains an eolian tuft known as the Lemuta Member (~1.66 Ma), which marks the beginning of faulting activity in the basin that caused the lake to recede to almost a third of its size. The upper part of Bed II indicates that the lake disappeared. Thus, swamp areas at Olduvai likely decreased, while grass-covered areas increased. Accordingly, the paleontology also reveals a major change in fauna between the lower and upper divisions of Bed II, with the appearance of new species typical of more riverine and open grassland conditions35. H. habilis persists through the ecological change characterizing Bed II. The specimen OH 16 derives from the Lemuta Member, and OH 13 derives from the layer right above (but below Tuff IID, ~1.48 Ma)38. Homo ergaster remains are also found in Bed II. Oldowan tools are found throughout Bed II, and Acheulean tools appear in the upper part of Bed II9. Beds III and IV are primarily alluvial (i.e. stream laid) deposits beginning ~1.4 Ma, after widespread faulting transformed Olduvai into an alluvial plain9,35 . At the same time, Bed II was exposed to erosion9,35. Generally, Beds III and IV are described together, as they are only easily distinguishable on the eastern side of the basin. Both Beds III and IV are characterized by fluvial and fluvial-lacustrine lithofacies, containing bright red colored clay and sandstone sediments rich in iron oxide35. The boundary between Beds III and IV is marked by a contrast in stream flow direction. Whereas Bed III received its deposits from the south and southeast, Bed IV received its deposits from the west and north35. Volcanic cobbles within Bed III were most likely carried by wind and river approximately 10-15 km from their place of origin35. The Acheulen tools found in association with H. ergaster fossils within Bed III were produced from the raw materials carried in by wind and rivers. Of Reck’s original succession2 of Olduvai Gorge into Beds I-V, only Bed V has been revised and separated into the Masek, Ndutu, and Naisiusiu Beds. Masek Bed: The Masek Bed is comprised of fluvial deposits similar to those of Beds III and IV. The Masek sediments were the last deposited before major incision in the basin, and lie disconformably over Beds III and IV. Masek Beds’ lower unit consists of 3 lithofacies (eastern fluvial, western fluvial, and eolian) and dates between ~1.07 to 0.99 Ma, and the upper unit is comprised of a single eolian lithofacie, dating to ~400 Ka9,35. While some Acheulen assemblages have been recovered from the Masek Bed, very few vertebrate remains have been found9. Ndutu Bed. Discordant radiocarbon dates obtained for Bed V initiated studies that revealed Bed V (and Va) was comprised of 2 very different units35. The older unit was termed the Ndutu Bed, dated between ~400 Ka and 75 Ka and is comprised of fluvial and eolian deposits that were laid over faulting, erosion, and partial filling of the gorge9. Like the Masek Beds, there are relatively few hominin fossils or artifacts in the Ndutu Beds. Naisiusiu Bed. The youngest unit at Olduvai is the Naisiusiu Bed. It dates between ~22 Ka and 15 Ka, and is comprised of eolian tuffs deposited after much of the gorge had been eroded to its present state35. The remains of modern Homo sapiens have been found in the Naisiusiu Beds, along with artifacts similar to those of the Kenya Capsian industry. Middle Stone Age tools derive from the Ndutu Beds, and Later Stone Age tools derive from the Naisiusiu. Reconstructing Olduvai’s paleoenvironments from the geologic, faunal and floral evidence suggests that Olduvai became increasingly arid over the last 2 million years, with sporadic wet periods9. This drying trend occurred over the course of Bed I’s deposition. For example, sediments from lower Bed I (beginning at ~2.03 Ma) reflect the presence of a shallow saline and alkaline paleolake that ebbed and flooded throughout time, reaching a maximum depth of 3 meters (m) and a diameter between 7 and 25 kilometers (km)9,35,36,39. The lake’s size fluctuations occurred correlated with the presence of intermittent streams from the volcanic highlands that drained into the valley35. Paleontological localities are common where these streams flowed into the lake9. Toward the top of Bed I, the lake was smallest; and by the lower part of Bed II, the lake completely disappeared (~1.7-1.6Ma). Pollen analyses conducted in the upper part of Bed I offers additional support for Olduvai’s aridification. Rainfall over a given period can be roughly estimated based on the presence of fossilized pollen representing highland forest conditions 36. Relatively high amounts of forest pollen reflect a more humid environment, while relatively low amounts of forest pollen indicate a drier climate36. Lower Bed I contains a high percentage of forest pollen, which suggests a mean annual rainfall of 1000 mm, while pollen from upper Bed I contains a lower percentage of forest pollen, suggesting a mean annual rainfall of 350 mm. Thus, the depositional period of Bed I was characterized by a shift from a wooded environment to a more open environment40. Evidence of faunal turnover around 1.7 Ma41 demonstrates a shift from a wet habitat toward a relatively drier open grassland. Fossilized urocyclid slugs, indicative of relatively wet environments, are common in lower Bed I. The presence of fossilized roots from papyrus and other shore grasses also indicate a wet, swampy region in lower Bed I. Murid rodent species that occupy wet habitats are common in lower Bed I, but are absent by upper Bed I, and replaced by species that signal a drier habitat36. In sum, the geological, floral, and faunal evidence from Beds I and II all point to a transition from a wet, wooded habitat to a more arid open grassland environment. Leakey MD. 1978. Olduvai Gorge 1911-75: A history of the investigations. Geological Society, London, Special Publications 6:151-155. Leakey LSB. 1951. Olduvai Gorge. Cambridge University Press: New York. Leakey LSB. 1959. A new fossil skull from Olduvai. Nature 184:491. Leakey LSB. 1965. Olduvai Gorge: 1951–1961. Vol. 1. A preliminary report on the geology and fauna. (Cambridge University Press: Cambridge. Leakey MD. 1971. Olduvai Gorge: Excavations in Beds I and II, 1960–1963. Cambridge University Press: Cambridge. Leakey LSB, Tobias PV, and Napier JR. 1964. A new species of the genus Homo from Olduvai Gorge. Nature 202: 7-9. Leakey LSB. 1960. Recent discoveries at Olduvai Gorge. Nature 188:1050-1052. Johanson DC, Masao FT, Eck GG, White TD, Walter RC, Kimbel WH, Asfaw B, Manega P, Ndessokia P, and Suwa G. 1987. New partial skeleton of Homo habilis from Olduvai Gorge, Tanzania. Nature 327:205–209. Leakey LSB and Leakey MD. 1964. Recent discoveries of fossil hominids in Tanganyika, at Olduvai and near Lake Natron. Nature 202:5–7. Wood B and Constantino P. 2007. Paranthropus boisei: Fifty years of evidence and analysis. Yearbook of Physical Anthropology 50:106. Tattersall I. 2009. Human origins: Out of Africa. PNAS 106:16018-16021. Susman RL and Stern JT. 1982. Functional morphology of Homo habilis. Science 217:931–934. Napier JR. 1964. The evolution of bipedal walking in the hominids. Archives de Biologie 75:673–708. Day MH. 1969. Femoral fragment of a robust australopithecine from the Olduvai Gorge, Tanzania. Nature 221:230–233. Day MH and Napier JR. 1964. Fossil foot bones. Nature 201:969–970. Tobias PV. 1965. Cranial capacity of Zinjanthropus and other australopithecines. Current Anthropology 6:414–417. Miller JA. Does brain size variability provide evidence of multiple species in Homo habilis? American Journal of Physical Anthropology. 1990;84(4):385–398. Gebo DL and Schwartz GT. 2006. Foot bones from Omo: implications for hominid evolution. American Journal of Physical Anthropology 129:499-511. Leakey LSB. 1961. New finds at Olduvai Gorge. Nature 189:649. Kimura Y. 2002. Examining time trends in the Oldowan technology at Beds I and II, Olduvai Gorge. Journal of Human Evolution 43:291–321. Ambrose SH. 2001. Paleolithic Technology and Human Evolution. Science 291:1748-1753. Hay RL. 1976. Geology of the Olduvai Gorge: A study of sedimentation in a semi-arid basin. University of California Press. Potts R. 1988. Early Hominid Activities at Olduvai. Aldine de Gruyter: New York. Kappelman J. 1984. Plio-Pleistocene environments of Bed I and Lower Bed II, Olduvai Gorge, Tanzania. Palaeogeography, Palaeoclimatology, Palaeoecology 48:171-196. Cartmill M and Smith FH. 2009. The Human Lineage. Wiley-Blackwell: New York. Peters CR and Blumenschine RJ. 1995. Landscape perspectives on possible land use patterns for Early Pleistocene hominids in the Olduvai Basin, Tanzania. Journal of Human Evolution 29:321-362. Bonnefille R, Lobreau D, and Riollet G. 1982. Fossil Pollen of Ximenia (Olacaceae) in the Lower Pleistocene of Olduvai, Tanzania: Palaeocological Implications/Pollen fossile de Ximenia (Olacaceae) dans le Pleistocene Inferieur d'Olduvai en Tanzanie: implications paleoecologiques. Journal of Biogeography 9:469-486.